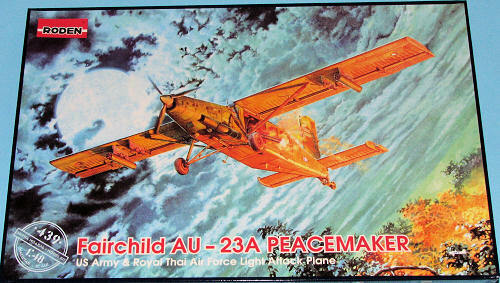 The AU-23A Peacemaker, the subject of this kit, was an armed gunship, counter-insurgency, utility transport version for the U.S. Air Force. It was used during the Vietnam War in the early 1970s. 35 were built under license in the USA by Fairchild Industries. All aircraft were sold to Royal Thai Air Force. Nice to see this aircraft kitted in this scale as the PC-6 and its multiple variants, have been widely used by both civilian and military services over the years. This is the first mainstream injected kit that I've seen for this aircraft. 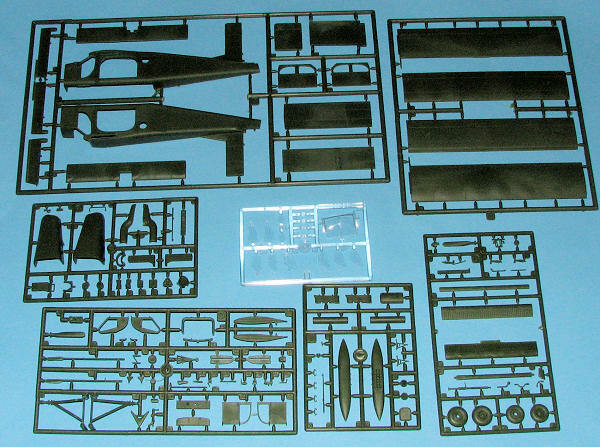 There have been short run and resin kits in 1/72, but basically nothing in 1/48 at all. It is not surprising that Roden would choose the gunship variant as their first offering. Generally those variants that are perceived as 'least desirable' are chosen for the initial release of a kit that will undoubtedly be brought out in many different versions. So let's take a look at the sprues. Molded in green plastic, there are nine total sprues, all of them with very nice surface detailing. Two of them are duplicated (the one with the weapons and the one with the wheels) and one is clear. I found some flash on parts as well as sink areas on the ones that are really thick. A few were also suffering from mold misalignment (notably the control sticks), and anything of any size had ejector pin marks or towers on one side. This means that a few parts (like the doors) will need some additional attention. The cockpit and cabin areas are nicely detailed with the cockpit being well appointed with four-piece seats, control sticks, rudder pedals and so on. The cabin has a three barrel mini-gun that itself is a small kit. Though there is a door for the gun side, that would normally be removed or slid back aft. Separate door rails are provided as apparently the other versions to be kitted will not have this feature. There are separate elevators, ailerons and flaps. However, these are to be constructed in the neutral position otherwise the various actuating rods won't fit. There is a separate lower fuselage section on which the landing gear will be attached. Not sure why this wasn't part of the fuselage halves, but there you have it. Of course, the engine assembly is separate to the rest of the airframe and is to be attacked near the end of construction. For weapons there is a pair of rocket pods and a dispenser of some sort. Instructions are well done with color references in FS 595, Testors Acrylic and Testors Model Master references. The instructions also have two diagrams to show where to drill various holes for the antennas and such. None of these holes are started so the measurements are quite exact as to placement. Markings are provided for three planes. One is a USAF version in overall Olive Drab as shown on the cover. The other two are Thai planes in the standard SEA camouflage. One is the initial plane with US civil registration and the other is complete with a neat looking shark mouth. 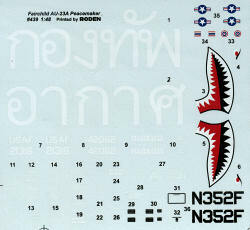 The decals are fairly well printed, though the Thai insignia is a bit off-register. Roden decals have not been very good on older kits, so it is unknown if these will be any better or not. One could hope so as there aren't any aftermarket options. As time goes on, we are seeing more and more esoteric subjects being kitted. Frankly, I like it and hope that the trend continues. This Roden kit would appear to have a lot of things going for it and really, only building it will tell how it goes. It looks like it makes into a super model and I'm sure we will be seeing other versions in the future.